I spent one thrilling weekend reading the Shatter Me series, and all I can say is "wow". 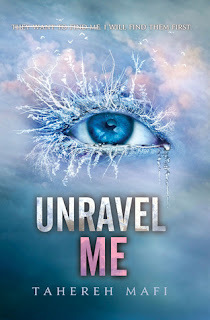 Tahereh Mafi has done an outstanding job with these books, and Unravel Me was probably the strongest and most exciting book out of the three books in the series. My only complaint is that now I have to wait for the next book to be released. I loved the setting of Omega Point, and the introduction of other gifted people. I thought the premise of the gifts and how they are used was very well-done. It made for an interesting read, and I liked that everyone has a unique gift, instead of all the abilities being focused on a few select people. I have never been a huge fan of love triangles, but the concept really worked well in Unravel Me. Especially after reading Destroy Me, I had a much better understanding of both Adam and Warner. I confess that I liked both guys in Unravel Me. I thought I'd be all about Adam, but Warner has his redeeming qualities and you really can't fault his devotion to Juliette. 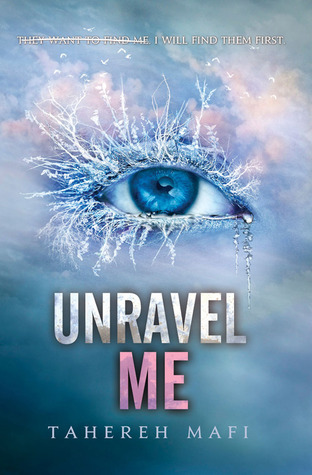 I loved that Juliette finally accepts and owns her abilities in Unravel Me. The ending was perfect, and while I was so sad to have the book end at all, I thought it was the perfect stopping point for the story. I really can't wait to see where Mafi takes the story in book three. I highly recommend the Shatter Me series.